According to the report, the growth rate of the real U.S GDP 2011 in the third quarter of 2011 was slightly revised down again from 2.0% in the initial estimate to 1.8% growth rate in the recent estimate; in the previous quarter (Q2 2011) the real U.S GDP grew by only 1.3%; thus the growth rate in the Q3 2011 was moderately higher than in the previous quarter and was also the best performing quarter so far in 2011. That being said, the growth rate for Q3 2011 was revised down for the second time and ended up much lower than the original first estimate of a growth rate of 2.5%; this revision may adversely affect the American stock markets and could also influence commodities traders to trade down major commodities such as crude oil, gold and silver. 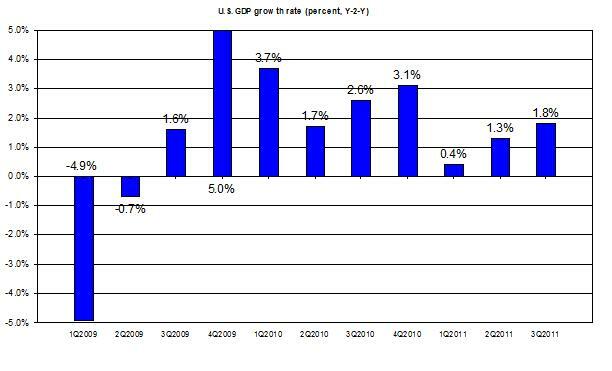 The chart below shows the development of the growth rate of the real U.S. GDP (Q-2Q) during the past few years. Nymex (WTI) crude oil price, short term future (January 2012 delivery) is traded up by 0.99%, at $99.65 per barrel as of 16:11*. Gold price, short term futures (January 2012 delivery) is traded at $1,609.00 per t oz. a $4.6 decrease or 0.29%, as of 15:00*. Euros to USD is currently traded slightly down at 1.3037 a 0.08% decrease as of 15:15*.